For today’s post, I am handing over to Jimmie Hepburn, who farms organic carp quite near to me here in Devon. During the Middle Ages, carp farming was commonplace, but once we were able to harness the power of ancient sunlight to plunder the sea, it mostly died out. Jimmie’s project, Aquavision, is beginning to make freshwater aquaculture financially viable. He wrote an excellent article on the latest edition of ‘Organic Farming’ magazine (Issue 101: for subscription details call 0117 914 2447). I thought it was rather wonderful, and asked to be able to reproduce it here. You can read the full article here. 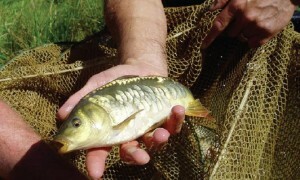 It’s certainly good to see traditional industries such as carp farming beginning to make a comeback. (I’m vegetarian, so I won’t be sampling carp any time soon, unfortunately) I wonder if we’ll see any traditional sea-salt pans reappearing too…? Certainly, if planned correctly, then they could be operated with little or no effort – except for collecting the salt, or course! Simple windpumps could be used to pump the seawater into the pans, where it could be evaporated either by the sun’s heat, or by burning driftwood. Well, it would be nice to see it anyway. we in Bedford have got a whole area set aside as a heritage site of archilogical interest. No one in the town really knows what it’s all about, they just know it’s a green area near the river that’s not been built up. but turns out the monks had fish farms there for centuries. would be nice to get that space used again. i’ll add it to the EDAP. A system such as aquaponics is also worth promoting. It closes the loop on any waste water created in aquaculture by filtering the water through vegetable grow beds. This article triggers a very interesting train of thought for me. As we need to guard against rising tides because of climate change, parts of the UK which are now land may become covered with water either temporarily or permanently. There are already moves in Eastern counties to make this happen, of course, by allowing the sea walls to be breached in places and salt marshes re-established as buffer-zones in times of flood. At the same time there is an increasing need for water storage facilities in times of drought. This could lead to a trend towards more aquaculture and water-based activities of all kinds in Britain – more watercourses and canals, more boat-travel, more ponds and lakes, more marshes, more creeks and a more indented coastline. Permaculture loves edges, because they are zones of high biodiversity which offer opportunities for all kinds of yields. The longer and wigglier the edge, the better. And everyone loves waterfronts whether for dwellings and businesses, play and leisure areas or places where people and things can be transported by water. So I would see an EDAP for more ponds as a very positive part of all this. Carp is a very popular fish in Eastern Europe, I believe, and in Poland was traditionally on the menu for Christmas dinner. If you travel through most of southern China there are hundreds of ponds for fish farming. I think most of the fish on menus there come out of the bottom of one or another of these ponds. Maybe we need to import their know how. I had the pleasure of listening to Jimmie talk one morning as part of the Sustainable Land Use course I did earlier this year.